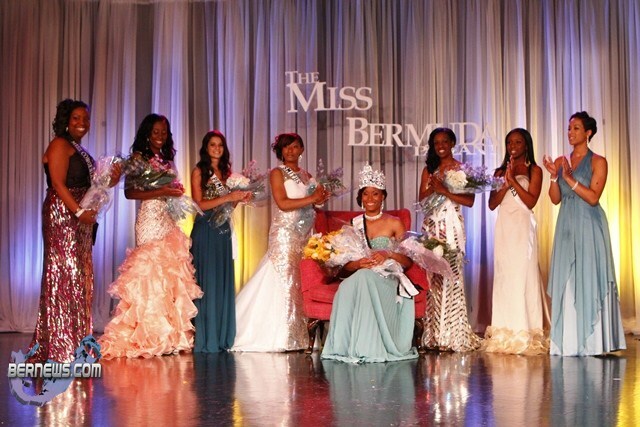 The 2012 Miss Bermuda Pageant is underway at the Fairmont Southampton Hotel this evening [July 8], and the top five have been announced, with the winner expected to be announced shortly. 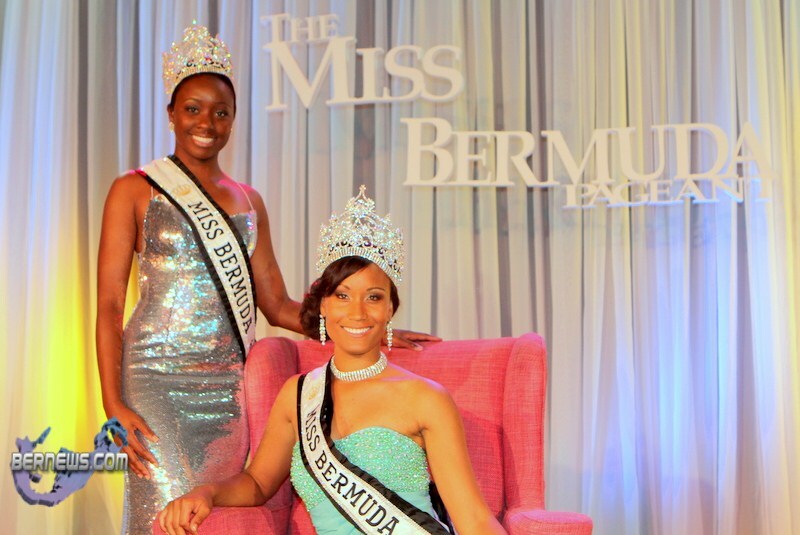 There were eight competitors vying for the chance to be crowned Miss Bermuda 2012. Pictured below top row L-R: Miss Deshona Perinchief representing Warwick, Miss Crystal Lyn representing Southampton, Miss Lene Hypolite representing Devonshire, and Miss Rochelle Minors representing Sandys. Bottom row L-R: Miss Dashunte Furbert representing Hamilton Parish, Miss Chelsy Furtado representing Pembroke, Miss Shannon Ingram representing St. Georges, and Miss Dwanae Simons representing Smiths. The winner of tonight’s pageant will travel to Inner Mongolia, China to compete in the Miss World Pageant on August 18, 2012. The show is being hosted by Patrina “Powergirl” Paynter and Nadanja Bailey, and the judges are Glenn Jones, Kristy “Miss Thang” Burgess, Miss Teen and Miss Big & Beautiful promoter Terry Smith, former Miss Bermuda Sophia Cannonier and former Miss Bermuda Colita Joseph-Cook. The show got underway at approximately with all the contestants coming out wearing one-shoulder fitted sequined short dresses. There was an opening dance number with choreography by Natasha Outerbridge, and the swimsuit portion got underway at 8.45pm. 16-year-old rapper Jelani performed, before the evening gown portion got underway, with the contestants escorted by members of the Bermuda Regiment. The interview portion took place with all eight of the contestants asked a question, and then local singer Devaune Ratteray performed, followed by dancers from United Dance Productions and local singer Sia Spence. The top five were announced just before 10am, and are pictured below L-R: Miss Chelsy Furtado representing Pembroke, Miss Dwanae Simons representing Smiths, Miss Deshona Perinchief representing Warwick, Miss Rochelle Minors representing Sandys and Miss Lene Hypolite representing Devonshire. Miss Shannon Ingram representing St. Georges, Miss Dashunte Furbert representing Hamilton Parish and Miss Crystal Lyn representing Southampton have been eliminated. We will update with the final results and other awards as able. Update 10.28pm: Miss Hamilton Parish Dashunte Furbert won Miss Congeniality, and Miss Photogenic was won by Miss Sandys Rochelle Minors. The Miss Photogenic competition was held on July 2nd on board the Uber Vida. The ladies were judged on confidence, personal style, the ability to produce an appealing photo and physical fitness. The judges for the Miss Photogenic were photographers Ivan Outerbridge, Eddie Smith, Anthony Wade and C. Anthony Francis. Update 10.35pm: Miss Sandys Rochelle Minors has been crowned the new Miss Bermuda, and will represent the island at the Miss World Pageant in China next month. Miss Pembroke Chelsy Furtado was 1st runner up, Miss Devonshire Lene Hypolite was 2nd runner up, Miss Smiths Dwanae Smith was 3rd runner up, and Miss Warwick Deshona Perinchief was 4th runner up. The new Miss Bermuda Rochelle Minors is pictured below with Miss Bermuda 2011 Jana Outerbridge. Miss Minors is a Berkeley Institute graduate, and presently lives in London where she attends the University for The Creative Arts in Rochester, where she is studying for a BA (Hons) in Fashion Design. Prior to attending school in London, Miss Minors obtained an Associates Degree in Art and Design with Distinction from the Bermuda College. A well known model on the local scene, Miss Minors has modeled in numerous fashion shows across the island since the age of 14, walked the catwalk during London Fashion Week, served as a hair model for the renowned salon Vidal Sassoon and participated in Salon International. 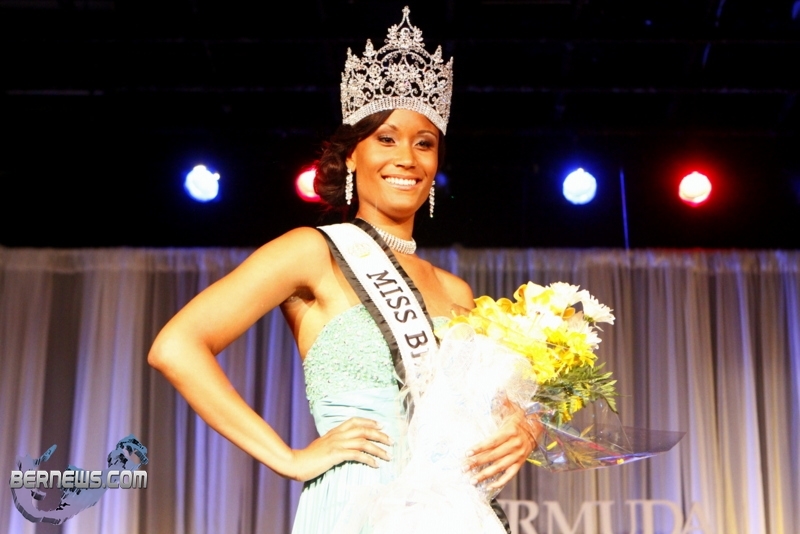 Update: View a few more photos of the Miss Bermuda show here. Best wishes to you all. It takes a strong individual to committ to something like this. All the training, lectures, rehearsals, photo / video shoots, public appearances are hard enough. But Im sure that is nothing compared to the negative comments made by many of the haters! I hope that you all remember the positive experiences and I trust that you will all be stronger women after today and I hope that the public encourage you all by posting positive only comments. DITTO ! Lets encourage ! C.S I have to agree with you. The competition was not just based on beauty – it seemed it was based on popularity as well. Rochelle was my second choice. I’m quite pleased with the decision. She’s pretty and has unusual, distinctive features-she kind of reminds me of a cat. Plus…have you seen her body? Definitely the best in the competition. I think the judges made a good choice for once. I’m still flabbergasted that Rachel Sawden didn’t win last year…I’m not sure if it was the same judges, but they should have their eyesight checked!!! Deshona is by far the most gorgeous of them all . She has the most beautiful eyes and a very alluring presence . Kanye West, I guess all the posters below your comment totally missed the joke… I got it! Pretty Funny! If you thought that “joke” was funny then you have a very poor sense of humor, plus that is like a 3 year old reference at this point. Congrats Miss Sandys. Welldone to all the ladies. you were all very beautiful. CONGRATS MS.SANDY’S ! REPRESENT BERMUDA AND YOURSELF WELL, PROUD OF YOU ! I am so proud of these amazing ladies and I would like to congratulate each and every one of them for a job well done. They really shone on stage and I’m sure they’re going to shine equally as bright in whatever they chose to do in life. What is really wrong with you BERMUDIANS??? Why are you always so quick to judge someone and/or put them down? You need to take a look at your life before you make all the unnecessary comments! That’s why they don’t go anywhere in life. So friggin closed minded they are. Why can’t a simple CONGRATULATIONS be said? Stop hating!!!! Jealousy is a B!t@h!!! At least your mind must be a little sharper as you are not trapped on ‘the rock’. Good luck with your future profession. Congratulations to Rochelle – how delightful to see such an impressive representative for Bermuda in 2012-13. It shows that beauty and brains can go together, and the result when the judges make the decisions. A very positive role model and she will represent herself and Bermuda well on the world stage. Congrats also to the runners up. On the flipside, the format of the pageant hasn’t changed from last year which is unfortunate and probably has a negative effect on more entries, and why in the picture showing her seated and crowned isn’t the 1st and 2nd runner up contestants next to her? The Miss Bermuda sign stayed in tack this year! lol minor improvement from last.. I guess.. But the amount of Cubic Zirconia’s in those crowns look Cheesy/ Tacky! she wont even place in Miss World. Really is this the best we have to offer..? i would have sent Crystal or Chelsea had it been my choice. Rochelle will do a lot better at Miss World than Jana did in 2011 for any number of reasons. Jana was 76th I believe. [edited] have done better then Jana did…we need to pick up our game..i walk from my office to get lunch and pass at least 10 girls better looking then Rochelle. Why didn’t they get in the competition then? Probably because they’re just good to look at and the moment their mouths open we taking an L. If not I’m sure they would have just gotten washed by the Top 5 that made it anyway so they figured they’d just chill. Whatever it is Roe’s our Miss World so let’s get it!! To WIN Miss Bermuda so many young females need to stop and think that a pretty face isn’t worth much if you cant Speak Well or Hold Yourself Well at all times. Not because you have a competition on Sunday, how about last week? Bermudians need young Positive Women to Hold Up High for our young females to admire. Stop fighting out nights, stop hanging with the ganstas etc. Chelsea great job for such a young girl……You should be proud. Bernews – Sophie Cannonier wasn’t Miss Bermuda…she was Miss Bermuda Islands. In 1988 there were two different competitions – Miss Bermuda was won by Kim Lightbourne and Miss Bermuda Islands by Sophie Cannonier. Congratulations to the winner! A better representative could not have been chosen! Represent Bermuda to the fullest, you’ll do FANTASTIC! Congratulations to Rochelle! I think she will do an incredibly good job representing our Bermuda. Good luck to you at Miss World. And to all the negative commenters, its so easy to be so negative when you are hiding behind fake names. You know Rochelle was a great choice. The top 3 were all worthy but only one could win. Finally they pick a pretty girl, someone who really can represent Bermuda well! People always say Bermuda is another world and the people are so nice . . . WRONG!!!!!!!! People say the nastiest things on here!!!!! Maybe all of you should get off the rock for a while and discover other cultures . . . n I don’t mean on a shopping trip either!!!!!!!!!! A beauty pageant is about beauty, poise, the ability to walk and talk in an eloquent manner . . . in other words its a whole package from the time they enter to the time they take their lasst walk across the stage!!!!!!!!!!! Please please learn something before making stupid and unnecessary comments!!!!! Miss Sandys Rochelle Minors surely deserved to be Miss Bermuda 2012 as she is absolutely gorgeous and smart, too! I am proud to meet her mom who looks as gorgeous as her daughter. Best of luck to you Rochelle in all your future endeavours!